The Egyptian Theatre in Downtown DeKalb is very excited to welcome back one of DeKalb’s own with the jazz group Sammy Miller & The Congregation. 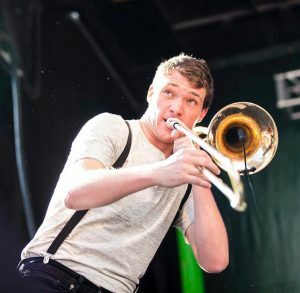 Trombone player and 2008 DeKalb High School alumnus, Sam Crittenden will be playing along with the rest of the band at the Egyptian on Tuesday, April 10 at 7 PM. Sammy Miller and The Congration takes our stage along with the DHS Jazz Ensemble on Tuesday, April 10 at 7 PM. Tickets are only $15 and all students with a valid student ID are free. Tickets can be purchased at the Egyptian Theatre box office during box office hours (Tuesday/Wednesday/Thursday 3-6 PM), online at www.egyptiantheatre.org or by calling the box office at 815-758-1225. The Egyptian Theatre located at 135 N. 2nd Street in Downtown DeKalb, IL is owned and operated by Preservation of Egyptian Theatre, Inc. a 501(c)(3) non-profit organization. Annual support provided by First National Bank, Northwestern Medicine, Shaw Media, and Tapa La Luna.